Increasing Incidence of Earthquakes: A Sign? By Paul LaViolette | April 20, 2014 - 7:17 am | June 21, 2014 Astronomy, News! 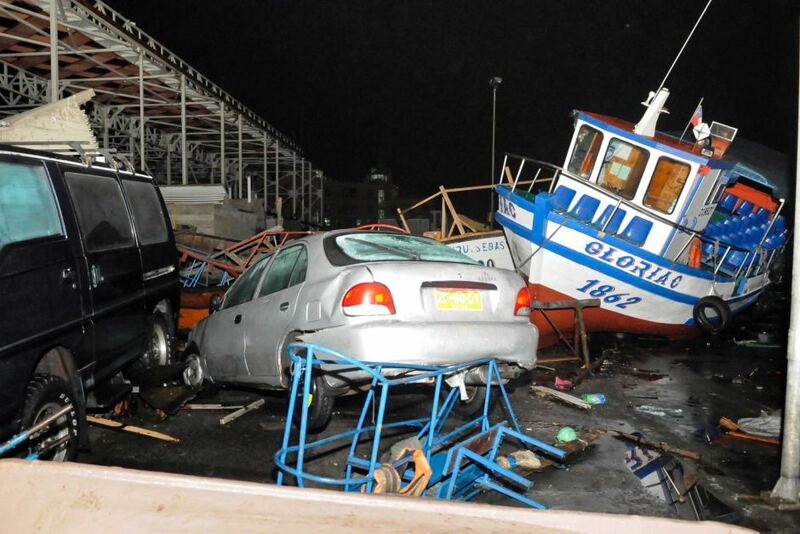 Result of the coastal tsunami caused by the 8.2 magnitude earthquake off the coast of Chili. In the superwave scenario I had suggested that the arrival of a superwave would be heralded by the arrival of a gravity potential wave which could trigger earthquakes around the world. That’s a Huge Amount of Movement. I have never seen such activity!!! West Pacific is just of out of control… I am surprised that the USGS is not issuing EQ warnings for the US! April 3, 2014 posting: We have been hearing news stories of earthquakes around the world (e.g., the magnitude 8.2 earthquake of the coast of Chili), and the possibility of an impending eruption of the Yellowstone supervolcano. “Those bison are running because that’s what they do every day in Yellowstone. This is the time of the year when bison naturally migrate in and out through the park,” said Jake Lowenstern, scientist-in-charge at Yellowstone Volcano Observatory. Migrating to forage, the scientist in charge of the Yellowstone volcano observatory says despite recent seismic activity. “We don’t anticipate an eruption anytime soon,” said Lowenstern. Meanwhile other sources say that the U.S. government has been instructing USGS to downplay and even publicly suppress information about the seismic events because they feel that Yellowstone is going to blow and the result will be a national catastrophe which FEMA is desperately preparing for. One youtube video, now removed, discussed a letter that someone received from someone on the inside at Yellowstone attesting to this suppression. One is left to wonder whether these current seismic events are related to an oncoming superwave, and whether an initially unitary gravity wave may have become fragmented into more minor events along the way. So far, though, we have had no announcement from gravity wave observatories of any definite wave detection. So perhaps we should not look to these as being caused by events coming from the Galactic center. One person has posted that the events are related to ongoing solar activity. Nevertheless, in the past several decades there has been a substantial rise in the incidence of potentially destructive earthquakes, of Richter 7.0 and above. Meanwhile, one person has reported in the comments below that a seismographic pulse has been detected synchronously in 10 seismographs at the Yellowstone location, something that baffles seismologists, and raising the question whether this might be gravity wave induced; see posting by Marcus below. 32 Responses to Increasing Incidence of Earthquakes: A Sign? I thought maybe this video could have somthing of interest. The level of seismic activity on our planet is directly related to the resulting vector of gravity of the solar system bodies. I don’t exactly know what you mean by the “vector of gravity of the solar system bodies”. Are you talking about oppositions of conjunctions of the planets? Only the Sun and moon oppositions/conjunctions are known to have an effect as far as I know. Obviously not all planets have the same responsibility. But you can not say that only and exclusively the gravitation of the Sun and Moon are involved. Is known the influence of the Sun and Moon in the occurrence of earthquakes? Could you point me to indicate where it is written and from when the relationship is known? Sorry, this is not my area and finding references would take time. What I remember is that Pat Bailey did a study about this about 20 years ago and found that there was a correlation to full moon and new moon phases. These are times when tides are at a maximum. So an effect on earthquake activity is understandable. On the other hand, planets are not known to have any significant tidal influences. I applaud your simple, but factual, response regarding the (lack of) effect the planets have on tides. Nonetheless, since some may be from Missouri – the Show Me State – we located two sites where there is enough technical information to back your simplified response to sink the proverbial battleship. Considering that about 40% of all Major Earthquakes which occurred during the last 80 years have taken place in the last 5 years, there is obviously something else afoot and we tend to agree with you as to the reason. please have a look at the linked seismographic chart from Yellowstone webicorder. The Yellowstone volcano is actually detecting some strange signal, that could possibly be associated with Sagittarius-A. The phenomenon could also be related with the G2-cloud. Last night I checked a couple of Webicorders of other American volcanoes. The pulse appeared there, as I had expected before. The solid layer of rock above the plume of Yellowstone is in relation to the giant magma bubble – that is directly connected to the igneous core of the planet – with only 5-10 km extremely thin, in contrast to other much smaller volcanoes, in which this layer is regularly 10 up to 20 km thick. In this respect, this scenario is similar to a speaker membrane, which is excited from below by a vibrating mass. If the mass is too small and the membrane in relation to thick, nothing happens. In this respect and on my opinion the Yellowstone volcano should be a perfect gravitational wave detector. The fact that the principle on Yellowstone works, I was already clear, especially since I had found that the Earth’s mantle above the volcano raises and lowers to the rhythm of the moon phases and the day-night-phase two years ago. If the current phenomenon should be further continues, the following is probably expected: The entire planet will heat up due to the permanent power supply, which will cause the planet to a total stretch, in the lower layers of the mantle be further liquefied, and may in the worst case – depending on the ratio of natural frequency in relation to the frequency of excitation – possibly resonate. The signal is with interruptions in between nearly constant. The pulse is measured in absolute synchronism of 10 seismographs throughout the northern half of Yellowstone Park. The area in east-west direction has an extension of over 100 km. What energy is required to periodically put such a large area to vibrate, can be imagined by comparing with those amplitudes of the Fokushima quake in 2011, which also went across from Japan through the core of the planet and was recorded at Yellowstone. If Sagittarius-A and the G2-cloud are responsible, I assume that this is only the beginning. So it would be quite possible, that the pulse always occurs when Sag-A absorbs large amounts of material, and that the respective amplitudes are related to the absorbed mass. You can simulate the phenomenon in a simple experiment, if you have your bathtub half filled with water and then remove the plug. Sag-A is analog the forming vortex, and the water surface is analog the space-time. As G2-cloud you need small floating spheres in order to be sucked into the whirlpool. In this experiment, you will find out that each sucked sphere cause a wave that propagates from the swirl out radially. Of course, I ‘m not sure if this principle can be applied, and if disturbances in the space-time continuum can propagate in the form of gravitational waves. However, this approach seems to be logical to me, because each reference system is defined arbitrarily in its relative position and movement in space. This also applies to the Keppler model. So a system of reference can also be chosen in rotation, so that the earth does not rotate around the sun, but occupies a fixed position and then commute in the rhythm of the seasons back and forth on the gravitational disturbances of relatively rotating sun. Ahhhh gees…. you guys are loosely connecting dots that are much more easily connected with simpler explanation. What is causing increase in quakes is simply two things that we know are real, not theoretical…. Magnetosphere compressions and tidal influences causing quakes. This increase in quakes now has affected volcanism…. Te bottom line – which is what really matters – is that they are increasing at an almost exponential rate. 2014-04-01 17:46:46 UTC-06:0020.1 km la lista completa hasta ahora presentemente Sol Frugone, esto es algo sin precedentes en tan solo 19 Dias!! apartir del 1 de Abril. -Earthquake shield: how science deflect “the big one”. French scientists are testing the deflection of destructive tremors, which could protect densely populated areas. By Sarah Gray, in Salon. -GIZMODO: How huge subterranean grids could protect cities from earthquakes. The QEG generator is awesome news …. I appologize, the article about the multiple Volcano’s erupting within hours of each other has been debunked. This article, originally posted November 2013, has been debunked. We apologize for any inconvenience this may have caused you. We pride ourselves on posting the truth, and the truth is, this ain’t true. Archived Volcanic Events of Interest at http://volcanoes.usgs.gov/activity/archive/index.php is a great resource to debunk most claims regarding volcanic activity of interest. Specially highly improbable grouping of events. Not a problem! – Let the one without sin cast the first stone. Anyone can make a mistake. This is not a good sign. Like earthquakes, coordinated global volcanic activity could be another indicator of an impending superwave. I am not a volcanologist to know how significant this is in terms of statistical probability. It would be good to compare this statistically with the history of volcanic eruptions. hi Dr. Paul I follow your work since 2012, and im pretty impressed with all you’ve done, and Seriously you must keep going foward Dr. Paul, I know people want to stop you, so do not let them get away with it. Well right now Im very confuse about two things. 1.- The wild climate, you know global warming etc , earthquakes,volcanism, and all the bio-organism has been affected even food has been affected and the air chemtrails: Do you think this is man made by the Global Elite ¨Goverment¨? 2.- Or is the reason about this happening, with all this chaos in our planet and probably the entire Solar-System, connected with the Superwave?. I have no way to know. Possibly the political unrest around the world is because people unconsciously feel that some threat is approaching but do not acknowledge this as the cause of their ill feelings because the threat has not yet manifested. We know from experiments on quantum entanglement that particle spin orientation can be transmitted over 100,000 times the speed of light. Some have suggested that telepathy works by such a mechanism and that human inner senses can perceive information even before the light signals arrive. Thank you again for your on-going research! I’m sure you’ve heard recently about the measurement of the CMB radiation that supposedly proves the existence of the fabled “gravity waves” of General Relativity. I was wondering, is it possible these could actually be galactic superwaves being detected in the CMB? I’m surprised you haven’t posted an article on that ‘discovery’ yet. It seems right up your alley. I don’t consider the report credible. Since the expansion hypothesis has been disproven long ago on the basis of cosmological test data which favors the stationary universe tired-light cosmology, any further attempts at trying to bolster an already dead hypothesis are futile. The scientists making this announcement are obviously projecting their cosmological beliefs into the data. Inkblot effect. What they are referring to is obviously due to some other cause. of earthquake data. Thanks also for the sobering 38 year incremental data. I hope all that all that report updates will use this page for that purpose and we will maintain a central archive exclusively on earthquakes over the coming months by staying on topic here. Many thanks to those that contribute. I think there may be a general increase in frequency and intensity of quakes over a longer time period, but it would also seem that because there has also been an increase and improvement in measuring devices, that this could account for some of the increase as well. I don’t think the very recent flurry of activity is related to the Galactic Center, but more likely related to Solar activity as well as a general Earth trend, which Edgar Cayce’s work talked about and foresaw a long time ago. Cayce’s readings on earth changes, unfortunately, have been some of the most misinterpreted, mythologized, and exaggerated though. At one point, i had to stop reading other people’s interpretations of same, and just carefully read what exactly his guidance said. It became clear that his guidance most focused on outlining general trends and patterns for different periods. Regarding a trend to a general increase in earthquakes, volcanism, climate change, i will outline why this has happened in a reply post so this doesn’t become to long and run on. There is also the general Consciousness factor to consider. Physical reality is not as solid and set as we perceive it, and everything is completely interconnected–there is an underlying Oneness. Collective human consciousness can influence the very patterns of the Earth and Sun. Build up of strife and of negative energies and emotions within many human hearts, can get mirrored in the Earth and Sun. This is not to say that it’s all about us, definitely not. The Earth etc are living entities unto themselves, and have their own growth and change patterns too. We just happen to be experiencing an unusual cycle wherein many larger cosmic and a number of smaller cycles are all at their zenith around the same time. Hence, to a large extent, we are on a ride and can mostly only control our reaction to said changes and events. However, collective prayer, meditation, and positive focus can be powerful stuff. It’s possible that people through collective spiritual attunement and focus could lessen some of the severity of changes at a more local scale (like per city or town etc). Anyways, Cayce’s info is explained in another post. Re: Cayce’s info and a general increase in earthquakes, volcanism, climate changes over time i wrote the following on another site. “Re: the Earth’s core and all that. It’s clear from Cayce’s Guidance that an internal shift in the inner core already happened awhile ago. They said it happened in 1936. They referred to it as an “upheaval deep within the earth”, if i remember correctly. Unfortunately, we cannot prove the above. Science does now know that there IS though a some 10 degree differential between the axial alignment of the inner core and the axis position of the rest of the Earth. Whether or not this happened in 1936 like Cayce’s guidance indicated, we do not know. I know Dr. LaViolette that you don’t support theories regarding crustal or polar shifting because the Ice Core evidence seems to contradict same. Cayce’s guidance definitely supports it as both a past trend and a future occurrence. Given that Cayce’s work is the most well verified and most vast and holistic psychic work on the earth to date–there might be something there. Isn’t it possible that such shifting can come in somewhat cyclical minor and major patterns, wherein during a minor cycle there is only a shift of say 1 degree or so, and during major cycles there is almost a 180 degree shifting? Both kinds of shifting would keep much of the core of the ice bound areas largely intact accounting for the age of the ice core samples. In any case, it’s clear that the trend of increase in earth changes from the mid 1900’s or so is not directly related to Galactic Superwaves, or even to Solar cycles, but overall more a kind of internal process. Now a good question is, if Cayce’s info is more or less correct, what caused that initial upheaval and shifting in the inner core back in 1936? Cayce’s guidance was vague about same, and just answered “cosmic” causes. That could be related to the Galactic Core in some manner. Perhaps even just a general increasing alignment changing gravity vectors? Who knows, but for the record i do not see a crustal shift culmination happening in the near future (though i do see the general trend of increase continuing and picking up in waves of intensity). We have enough on our plates with a Galactic Core outburst and resulting influence on the Sun. Yes, I agree with your suggestions on polar axis alignment. I have stated other times that a jerk like movement of the Earth’s spin axis by some hundreds of meters or even by one degree could really cause catastrophic effects and yet be compatible with the ice record which indicates that the Earth has not been affected by any pole-shift-induced climatic changes. Hence ruling out the scenarios of Hapsgood, Velikovsky, and Flemath (who originally wrote the idea as a scifi story. On the basis of the geological record, though, one cannot rule out a 180° pole axis flip. I agree, prayer may be a way to change the outcome of such an event. There is one near-extinction event that is fairly well-known, although it remains controversial. Roughly 70,000 years ago, give or take a few thousand years, an enormous eruption occurred in what is now Sumatra, leaving behind Lake Toba (the crater lake pictured above). The eruption coincides with a population bottleneck that is often cited as the reason for the relatively low genetic diversity across Homo sapiens sapiens. Research suggests as few as 2,000 humans were left alive by the eruption and its aftereffects. then perhaps a Superwave, arriving shortly after, would explain the near extinction events we have seen before. We covered this matter extensively in http://www.mgr.org/RegisteredEarthquakes.html and links associated with it. We stopped issuing the information since we had proven the point without doubts. I have no doubt that when the galactic superwave & its gravity wave precursor component do indeed arrive, we will experience unprecedented seismic and volcanic events. However, I am fairly certain that the most recent quakes in Chile can be attributed to the CMEs generated over the past few days, following the X-class solar flare on March 29, 2014. Earth Quakes and it showed a deepening of recordings on very close to 3 consecutive days … e.g . Obviously I am no expert in Seismology but it seems to indicate maybe an upward flow happening ?? Or cracking of the egg shell may be a better description ?